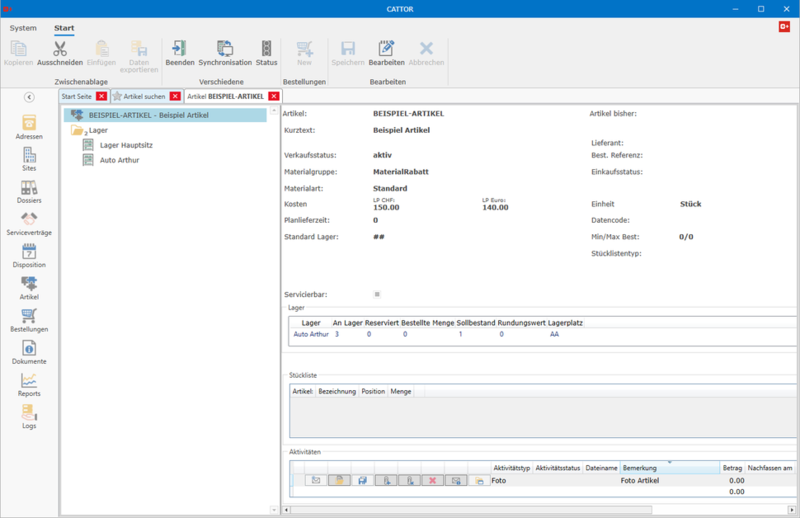 CATTOR supports a complete article management. The articles can be imported through an interface or added in CATTOR manually. Various columns to classify the articles are available like e.g. buying price, two sales prices, etc. An article can be on stock in multiple warehouses. Bill of materials can be used as well. In CATTOR we distinguish warehouses that have stock managed in CATTOR (internal) from warehouses that have an external stock management like e.g. SAP (external). On the article we list the amount on stock for each warehouse, the amount that is used in orders not done. The bill of material or in which bill of material the article is used is shown as well. For these warehouses the amount on stock is taken from an external system like e.g. SAP. Internal warehouses are completely managed by CATTOR. We can handle stocks, generated supplier orders to refill and handle goods in.